Welcome to Lightroom Plugins, a place for you to find those little extras that make your Lightroom life easier. We only sell plugins written by ourselves, so you're guaranteed to get personal service and advice on the best way to use them to help you improve your workflow. Can't find what you need? LET US KNOW! We're always looking to expand our range of plugins, so new ideas are welcome. Everyone works in different ways, and something that you need desperately might not be obvious to us. All the plugins here are FREE to try. We also have some tutorial videos on YouTube. We would also ask for your help to support a charity called MAG - the Mines Advisory Group. Landmines and bombs still pose a very real threat to communities around the world today. One person every hour is reported killed or injured by a landmine. MAG (Mines Advisory Group) is a charity that removes these deadly weapons from the land, saving lives and allowing people to walk, farm and live free from fear. When you buy one of our products, we invite you to give a donation to MAG, as little or as large as you would like! In 2017, donations from Lightroom Plugin customers amounted to a huge £4,008.91! Together, we do make a real difference. In 2017, MAG removed and destroyed over 100,000 deadly items, cleared over 47 million square metres of land and benefitted over a million people. Please donate today so we can help make even more land safe. Thank you. 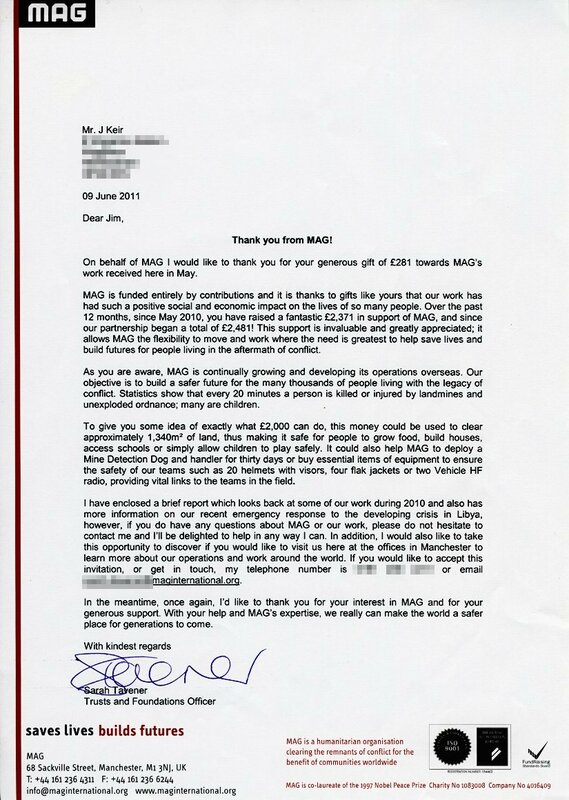 Here is a copy of a letter we received from MAG, thanking you, our customers, for your support. All Lightroom plugins tested against Lightroom 4 through 7 (CC Classic)! Work with your Lightroom images on your iPad! Use AI to automatically add keywords to your photos!